If you’re anything like me, the documentation and publication of the many failings of human beings–be they grammatical, physical, or intellectual–makes me laugh. Really hard. (If they don’t, bear with my cruelty for a few more minutes, eh?) Which is why sites like the Darwin Awards and FailBlog are popular enough to have tons of traffic; let’s face it, we like to laugh at other people and feel highly superior. If this sounds familiar, then StuckPixel’s EPIC FAIL app is right up your alley. Frequent visitors of FailBlog will notice right off the bat that many (if not all) of the EPIC FAIL photos come directly from the FailBlog website itself, so EPIC FAIL could potentially be a handheld replacement, if you’re all right with missing some FailBlog posts along the way. Upon launch, you are presented with a four-photo panel of photos, under the default Recent tab; you can switch to Popular or Random by tapping the respective tabs. Use the arrows down at the bottom of the screen to scroll through the thumbnails until a photo catches your eye. Tapping on it will enlarge the photo, as well as display a few bits of information: the URL of the photo, it’s average rating, and amount of times it’s been downloaded. Enlarged photos have pinch-zoom ability; you can also use the arrows in the enlarged photo screen to scroll through individual photos. Or, you can tap the double carrot (the third icon) to Download, Rate, or Share the photo in question. Tap the second icon to return to the four-photo panel. Repeat the above to enjoy more failure. If you like the EPIC FAIL app, tap the info button on the top right of a home page to see similar apps that might interest you. As mentioned above, I take (perhaps too much) pleasure in visiting FailBlog, so EPIC FAIL is right up my alley. I don’t like to miss out on posts, however, and this app doesn’t seem like it pulls every single photo from the site. Also, EPIC FAIL is strictly a photo app for now, but a good portion of FailBlog posts are video-based, so it’d be great if later updates could incorporate video stream as well. The layout of the photos is neatly organized and intuitive to explore…the only item that detracts from it are the ads that flow across the bottom, but I don’t really mind, because this app is the awesome price of free! 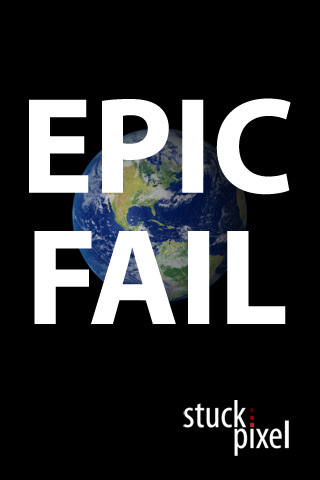 EPIC FAIL is a nice way to spend a little time boosting thine own ego, and a very low cost. Can’t really argue with that, now. AppSafari review of EPIC FAIL was written by Julie Guan on August 31st, 2010 and categorized under App Store, Feeds, Free, Net, Photos. Page viewed 4405 times, 1 so far today. Need help on using these apps? Please read the Help Page.